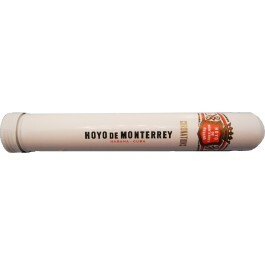 The Hoyo de Monterrey Coronations Tubos is an affordable and mild corona, of 42 ring gauge, 5.1” (129mm) long and comes in a box of 25 cigars. This short smoke packs the typical Cuban flavors that can be smoked on-the-go as it comes in an elegant and convenient aluminum tube. The flavors offered by this Habanos are of wood, earth, leather, coffee, nuts, fruits and floral characteristics. The Hoyo de Monterrey Coronations Tubos is a perfect stogie to smoke on the go as it is short and comes in an elegant aluminum tube. •	Mild-to-medium bodied smoke with typical cedary, herbal, leathery flavors. •	Affordable 50 minutes smoke. This cigar is simply a great morning smoke. The cigar is looking good, despite its somewhat rustic look, it is hand rolled decently. The wrapper has a nice and uniform medium brown color. It feels good in hand, with no apparent soft spots. A sweet tobacco aroma comes from the wrapper with some notes of dark chocolate as well. At cold, the pre-draw gives some earthy flavors. Once cut, the draw is good, while a bit on the tight side. Lighting up the cigar doesn’t present any problem, and the burn is fine so far. Nice white and creamy billows of smoke are created at each puff. The ash holds on nicely at the end of the cigar. The first third of the cigar starts with a rather powerful flavors of earth, the Coronation is a medium bodied cigar at this point. After the few first puffs, the strength recedes and now allows us to enjoy the other flavors that are arising. There is some wood, some floral characteristics and herbal notes. Some spicy notes also join the mix further on, but they are not too strong. In the middle third, the flavors get a bit stronger, towards the medium range in terms of body. The dominant flavors are similar to those in the first third. In addition to cedar, floral notes, there is now some leather and some fruit notes. There are also hints of nuttiness and of some sweet coffee taste. In the final third, the flavor profile doesn’t evolve anymore, letting you enjoy the rich cedar, the leather and its herbal character. It has to be put down towards the nub, when it becomes a bit hot and slightly bitter. But overall, it is a very pleasant smoke. In summary, the Hoyo de Monterrey Coronations is an ideal every day smoke: cheap, short and tasty.